"This is a perfect ending to an Italian dinner! 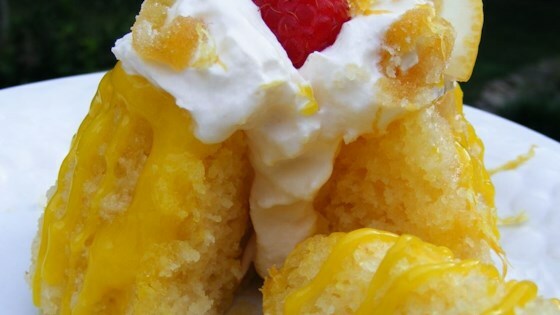 A favorite of my family's, this recipe was born as we were trying to figure out how to incorporate our bottles of imported limoncello into a yummy dessert. It's our adult twist on the always refreshing lemonade cake (and surprisingly guilt-free!)." Preheat oven to 350 degrees F (175 degrees C). Prepare an 8-inch cake pan with cooking spray. I loved this cake!!!! I did choose to substitute natural applesause for the 1/3 cup canola oil to cut down on fat. It was great!!!! Very guilt-free. Very tasty and diet-friendly!!!! !